There’s a technology behind Bitcoin that worth at least 10 times more than Bitcoin itself. It called the blockchain. And will revolutionize the way you live. Imagine: Instant bank transactions. Buying a new home in days instead of months. Identity theft? A thing of the past. The blockchain promises to speed up business and build a fortress around your personal data. It why this year alone, a single industry spent $1.7 billion to develop it. And by 2022, another $11.7 Billion will be spent worldwide. By 2030, the blockchain industry will add $3.1 trillion of business value according to Gartner Group. The fuel behind blockchain is a handful of “super-crypto” coins. Each has technology more advanced than Bitcoin. These “super-cryptos” will support social media platforms. Video games. Land registries. Stock markets. Mobile apps. Even entire governments. It’s one reason why our three “super-cryptos” made bigger gains than Bitcoin in 2017. To help you identify and own the very best cryptos leading this technological revolution, we’ve created our flagship cryptocurrency investing newsletter, Weiss Ratings Crypto Investor. Using our scientific ratings system, we identify the next crypto-currency investments – both coins and stocks — that could make you richer than Midas in the next 24 months. Plus, we’ll show you how to cash in on this revolution using your IRA – no new crypto accounts required! We’ll reveal the best crypto-stocks and ETFs poised to explode as the $3.1 trillion blockchain revolution unfolds (one’s already poised to make you 6 – 10 times your money in the next 24 months). That means you won’t need to buy a single crypto coin to make big crypto gains. Join now for less than 22 cents a day. Gift #1. Super Crypto #1: 20,000 Times Faster than Bitcoin. Gift #4. Crypto Investing for Newcomers — A Step-by-Step Video Course for Crypto Investing. Gift #5. Weiss Crypto Alert via email three times weekly. Gift #6. 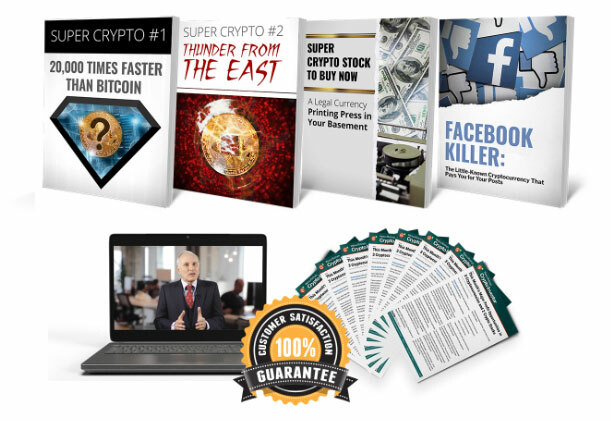 Facebook Killer: The Little-Known Cryptocurrency That Pays you for your Posts. Try Weiss Ratings Crypto Investor for one full year. If you’re not thrilled with the money our recommendations make you, just let me know and I’ll rush you a full refund — even if it’s the last day of your subscription. And keep all 6 gifts — our way of saying “thank you” for giving Weiss Ratings Crypto Investor a try.